From my window, you can see the village square. It isn't typically English in the traditional sense - there is no market cross in the middle. But we have a village pump that people gossip around, a shop, a pub, a red telephone box and a village green behind a picket fence. The square is bounded by old cottages, mostly dating back to Victorian times but, in the case of the Grigg hovel, the crick frame inside indicates its 16th century origins. There is a plaque on a cottage wall commemorating the visit in 1651 of a king on the run from the Roundheads. It is an interesting square, a focal point, and many of the buildings are listed. You have to jump through various hoops in triplicate before you are allowed to carry out alterations. And quite right too. However, if you are the county council, you can do what you like. 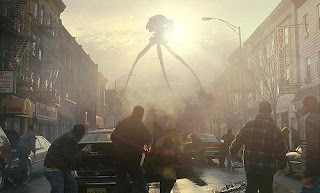 In recent years we have had modern street lights that look like the monsters from the War of the Worlds movie. The lamp posts start in the square and then march down the road. Two weeks ago, black plastic bollards appeared from nowhere and were put on the pavement in front of a handsome stone house - ostensibly to stop the owner parking on it, although a quiet word would have done the trick. And now? Oh, you would not believe it. A white crescent of sand has materialised in front of the shop. It is meant to delineate where cars can park. But the talk in the pub is that the village has been taken over by the bureaucrats, whose standard response to the question 'why?' is 'Safe Routes to School'. There is also a crescent of the same white sand in front of the house next door where cars can't park and then a long sandbar down to the school in lieu of a pavement. Villagers want to set up a beach volleyball team to play on the sand under the floodlights. They want to get a photo of themselves in deckchairs, sunglasses and knotted handkerchiefs and send it to the Daily Mail. No-one disputes the safety of children is paramount. But there are ways of doing things. And the way this saga has unfolded in the Enchanted Village is a prime example of how not do it. 'How dare they spoil our village,' said one. 'They don't have to live here,' wailed another. Meanwhile, up the road on the village outskirts, where Bellows and his community-minded team have restored an unloved football field, the story is the other way round. The children, quite naturally, use a shortcut to get to the field. So Bellows and crew have carved out steps so they can still come and go. His team of parents has put up a wooden fence 'crash' barrier to stop the youngsters running out in the road and being flattened by speeding cars. The same council has come down on them like a ton of sand. The fence is too close to the highway, apparently. Pass me the bucket. I'm going to make a sandcastle. Use that sand - encourage the wobbliest, most pink and goose-pimply to stretch out in those beachy village-centre areas. Take photos and then write to the council to thank them for making your village a holiday destination. We've just had a visit from a neighbour who came to complain about our rooster. He commented that we must 'hate' him because we have a rooster that wakes him in the morning. Bureaucracy, dont you just love it, the absurdity of it all and the pompous arses that dictate it. Same everywhere only I think they use more paperwork here. Sounds like bureaucracy gone mad!